After a non-conference, overtime loss to UW-Platteville, the Duhawks finished off their regular season with three straight conference opponents. This final stretch began with a visit to Decorah and a match against the No. 17 Luther Norse. This match-up saw the return of sophomore defender Jimmy Ralph and the season debut of junior midfielder JoJo Schmidt, both of whom had been sidelined by injuries. From the beginning, the game was an all-out sprint for both sides, resulting in a number of scoring chances. The Norse struck first when JW Slauson found Clay Walker on a cross to make it 1-0 in the 22nd minute. Despite the early disadvantage, the Duhawks were able to keep their composure and not allow Luther to gain any momentum going forward. In the 40th minute, Jimmy Ralph found the head of junior Bryan Irwin and he sent it towards the net. After a scramble in front, senior Mike Pizzello blasted the loose ball home to tie the game at one. As the second half began, both teams picked up where they left off and the high tempo play resulted in chances up and down the pitch. Loras was able to show off their roster depth, making 15 substitutions before the 70th minute. These fresh legs allowed the Duhawks to put on constant defensive pressure and resulted in chances on the offensive end. In the 70th minute, Jimmy Ralph sent a ball to the far post for Bryan Irwin. Instead of taking a shot on goal, Irwin found JoJo Schmidt in front to put away the game winner. This goal came only 54 seconds after Schmidt was brought on. “I knew I wasn’t going to miss it point blank, I just kept my composure and put it away,” JoJo Schmidt said of his game-winner. The Norse tried to equalize, with a number of opportunities in the attacking third, but could not put any shots on frame, and the Duhawks took the match, 2-1. The win set the stage for the Duhawks’ final regular season home game against the No. 15 Wartburg Knights. The atmosphere was playoff-like as the Duhawks honored the class of 2015 and hosted rival Wartburg. 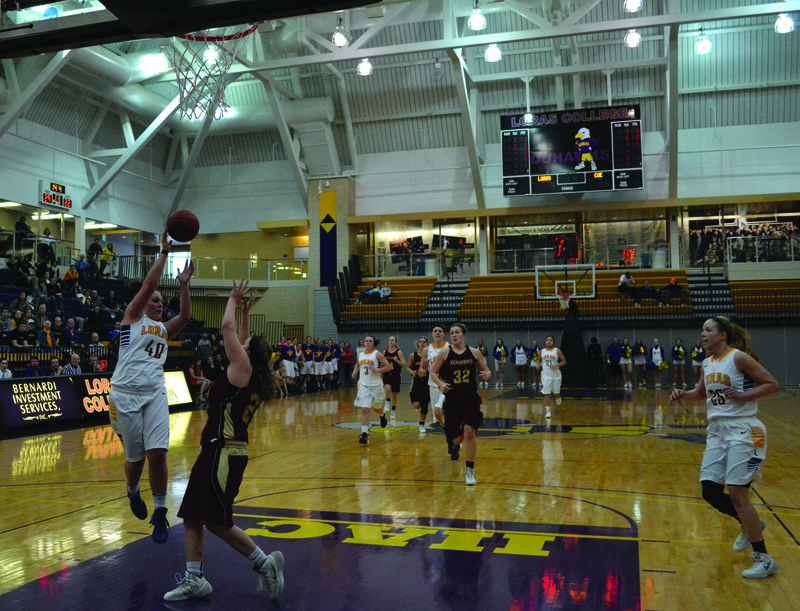 With a victory, Loras would clinch the Iowa Conference regular season championship for the third consecutive year. Coach Dan Rothert knew the significance of this game more than any other on the schedule. Even with this high energy, the visitors took the early lead when Zubeen Azari blasted a shot past sophomore Adam Roloff to put the Knights up 1-0 in the 18th minute. The Duhawk subs played a huge role again, equalizing the game when sophomore Kyler Olson found Bryan Irwin for the header goal. Still reeling from the tying goal, the Duhawks were able to take full advantage of the momentum when senior JD Perez sent a 50 yard free kick into the back of the net. The Duhawks held off the Wartburg attack and put the game away late. Senior Dillon Olson broke through a slew of Knight defenders and dribbled 40 yards down the field. Olson saw his chance and buried the insurance goal, celebrating with an acrobatic flip. “I saw an opening, took it past a couple guys and when I saw the last defender, he hesitated, and I curled it home,” Olson said about his title-clinching goal. With the victory, the Duhawks clinched their ninth Iowa Conference regular season championship and earned a bye in the conference tournament. They were now onto Cedar Rapids for the regular season finale against the Coe Kohawks. Early on against Coe, the Duhawk offense could not break the scoreless draw. Coe goalkeeper Eric Hoar stopped three shots on goal in the first 15 minutes, but first-year Spencer Moore was able to beat him to make it 1-0 in favor of the Duhawks. The second line for Loras came on in the 25th minute and swung the momentum in their favor. Junior Jorge Simon found fellow junior Mike Gordon on the run and he scorched the shot past Hoar for a 2-0 advantage. Three minutes later, senior Mike Pizzello hit a long distance shot for his 11th goal of the year, increasing the lead to three. The final goal of the first half came only 57 seconds later when sophomore Austin Jacobi blasted a shot through Hoar’s hands to make it 4-0 Duhawks at half. With the game in hand, Coach Rothert chose to rest his starters and allow the bench to get quality minutes. Bryan Irwin found Chris Paulino on a redirection, extending the lead to 5-0. With four more goals over the final 30 minutes the Duhawks finished their rout with a score of 9-0. The Duhawks finished the regular season with an overall record of 14-2-1 and a perfect 7-0-0 record in conference play. The Duhawks moved onto Iowa Conference tournament play, where they took on the University of Dubuque Wednesday night in the Rock Bowl. The late result can be found online at Duhawks.com.